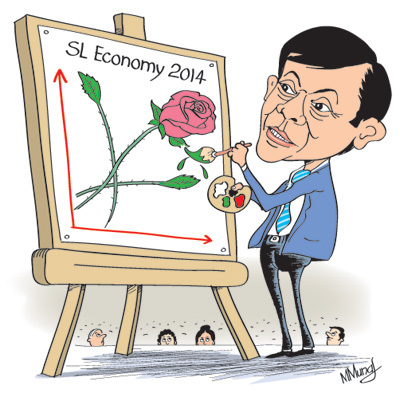 Central Bank Governor Ajit Nivard Cabral presented the Road Map for 2014 on January 2 against a backdrop of scepticism about official statistics. Revelations in parliament disclosing evidence of massaging national accounts figures hurt credibility of official statistics. Nevertheless, the wide-ranging Road Map is a review of the country’s recent economic performance and expectations in 2014 and beyond. It is a useful exercise begun by Governor Cabral eight years ago as it provides valuable data and information for discussion on economic performance. However, its one-sided glowing depiction of economic performance and expectations ignores fundamental macroeconomic problems. It is not a balanced scorecard. The weaknesses in economic data have been known for decades, but manipulations to increase critical performance statistics are recent. The disclosure that the 2013 fourth quarter growth was massaged to give a higher GDP for 2013 has serious implications. Although a few decimal points up or down in GDP growth is not an issue in assessing economic growth, its exaggeration distorts many critical economic indicators, as conventional assessments of the economy are based on the GDP as the denominator. The public debt, fiscal deficit, trade deficit and several other indicators are in relation to the GDP. A higher GDP results in lower ratios of these and distorts key economic indicators. Exaggeration of the GDP is however double-edged. Some indicators turn out to be unfavourable precisely owing to the overestimated GDP. A significant such statistic is the revenue to GDP ratio that has been declining in recent years from about 15 per cent of GDP to only 13 per cent in 2012. Although revenue collection has been higher, the ratio has been declining as the GDP is increasing. The international experience is that of the revenue to GDP ratio increasing when GDP increases. This too casts doubts of the GDP figure. The Road Map disclosed that the economy grew by 7.2 per cent in 2013, somewhat lower than the expected 7.4 per cent. Even a GDP growth of 6 per cent is a good economic performance in the global context. More significant than the overall growth rate are the sources of growth. According to the Road Map the agricultural sector grew by only 4.1 per cent, while industry grew by 8.1 per cent and services grew by 6.7 per cent. Growth in industry and services matter most for overall growth since agriculture contributes only 11 per cent to GDP, while industry accounts for about 30 per cent and services for 59 per cent. The high growth components of these sectors are construction by 10 per cent, mining and quarrying by 12.5 per cent, hotels by 13.6 per cent, electricity by 11.2 per cent and transport by 11.8 per cent. In contrast, manufacturing grew by only 6 per cent. This poses the question as to whether the 7 per cent growth is a healthy and sustainable one. The Road Map takes pride about the increase in exports in 2013. The turnaround of western economies and the depreciation of the rupee were responsible for this. The improvement in exports, especially in the last quarter of 2013, when monthly exports reached over US$ 1 billion, is heartening especially as the increasing trend in exports of manufactured goods is likely to continue. However, exports of US$ 10.5 billion were only 55 per cent of the value of imports of US$ 19 billion. Although the trade deficit is expected to be lower in 2013 than the large trade deficit of US$ 9.4 billion in 2012, it is still high at about US$ 8.6 billion. It is irresponsible to be complacent about the large public debt merely because the debt to GDP ratio has been declining due to the increase in GDP. The public debt has increased sharply in recent years: a more than threefold increase from Rs. 2.2 trillion in 2005 to over Rs. 6 trillion in 2012. In addition, the Government has used state banks to finance government expenditure. When these contingent liabilities of the Government are taken into account the public debt is higher. The debt servicing cost as a proportion of revenue is a better indicator of the crippling effect of the large public debt. In 2012, debt servicing costs absorbed more than the total revenue (103 percent). What is it likely to be in 2013 and 2014? Revenue is likely to be inadequate to meet debt servicing costs in 2013 too because of the increasing debt servicing costs and tardy increases in revenue. The inadequacy of revenue to meet even debt servicing costs means that all current and capital expenditures have to be met by further domestic and foreign borrowing. This vital issue in public finances does not merit attention in the Road Map. The increasing foreign debt that was discussed in last week’s column is another serious concern that the Road Map does not address. Foreign debt tripled between 2000 and 2012 and doubled between 2007 and 2012. By the end of 2012 foreign debt increased significantly to US$ 28 billion and it’s servicing absorbed 21 percent of export earnings. This is a strain on the balance of payments and raises the issue of foreign debt sustainability. Besides the increases in foreign debt, recent loans have been commercial borrowings at high interest rates. In 2012, the debt profile shifted more towards commercial borrowing rather than concessionary loans from bilateral and multilateral sources. This shift increases the debt servicing costs due to both higher interest rates and short-term nature of such debt. Foreign borrowing is not inherently bad. It can spur an economy to higher levels of economic growth than with domestic resources. However, there are concerns on the extent, costs, terms of borrowing, and use of funds for sustaining economic growth. The country has made much economic progress recently. The economic growth rate even adjusted for any exaggerated statistics has been high. There is every prospect that 2014 could be a year of higher growth. However, it is important that evaluations and expectations of the economy do not portray only a glowing picture glossing over fundamental problems. Jayaratne defying President: Who’s backing him?